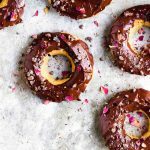 Vegan and gluten-free vanilla baked donuts frosted with an easy chocolate ganache, roses petals and cacao nibs. A stunning, and easy donut recipe. Hello you guys. I have something really special for you today. These vanilla baked donuts come together in under twenty minutes. They are then dunked in an easy chocolate ganache, and topped with cacao nibs and edible rose petals. And they happen to be gluten-free, vegan and refined sugar-free. These are my dream donuts. And they’re all for you. Because I love you. And because it is almost Valentine’s Day. As soon as I am done writing this, I am going to go pack my bags. I am about to go on a proper and much needed vacation to Italy, to visit my husband’s mother and family. I am desperately trying to remain unplugged for the week. And even though I’m crazy excited about the idea of that, I know that it might not fully happen. I am going to try my best though. And I am sure I’ll be posting the best of my pizza, pasta and wine over on Instagram. So come and hang out over there with me. Living vicariously is good for the soul. Right? These baked donuts are so easy. This recipe for baked donuts uses just six ingredients. Nothing odd or complicated. Just basic pantry staples that you probably already have on hand. You can use all-purpose flour or the gluten-free flour I recommend in the directions. They are lightly sweetened with maple syrup. 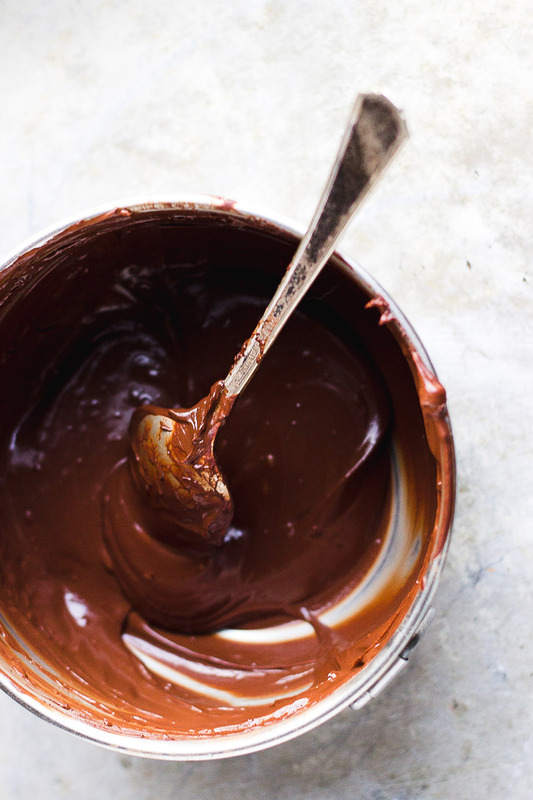 And then dipped into a luscious, easy chocolate ganache frosting. But the cacao nibs and rose petals might be my favorite part. 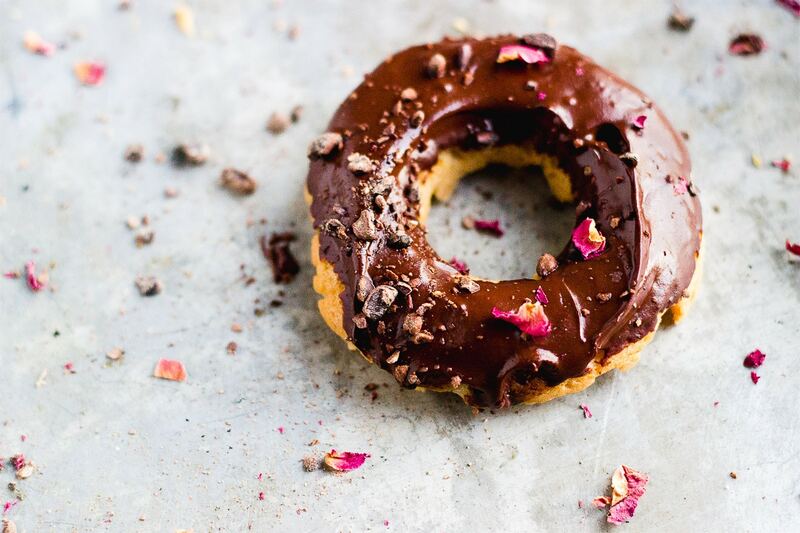 These baked donuts with an easy chocolate ganache are very appropriate for Valentine’s Day. But they are also very appropriate for anytime and for just because. Or to celebrate loving yourself. Also, I am really into eating rose petals right now. I love them in my tea. I love them in my cocktails. I love them in my desserts. Store extras in an airtight container on the counter. Preheat the oven to 325 degrees, and lightly spray two donut pans with vegetable oil. In a small bowl whisk together the maple syrup, milk, oil and vanilla extract and set aside. Then in a medium bowl whisk together the flour, salt and baking powder. Pour the wet ingredients and combine well, but be careful not to over-mix. Distribute the batter evenly into the donut pans and bake for 15 minutes. Remove the donuts from the oven and cool completely. 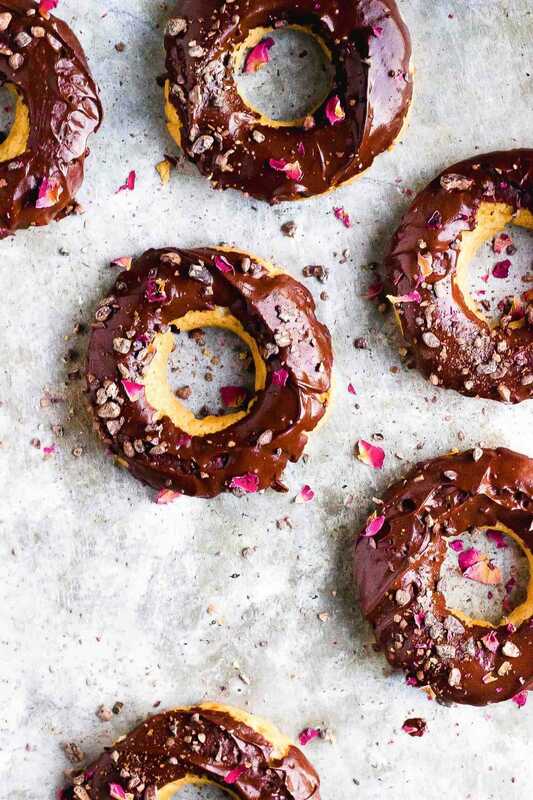 Then dunk the donuts in the ganache frosting and sprinkle with cacao nibs and rose petals. 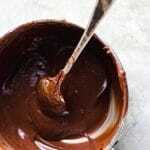 Whisk all of the ingredients together in a small bowl until smooth. More baked donuts you will love. These are gorgeous. 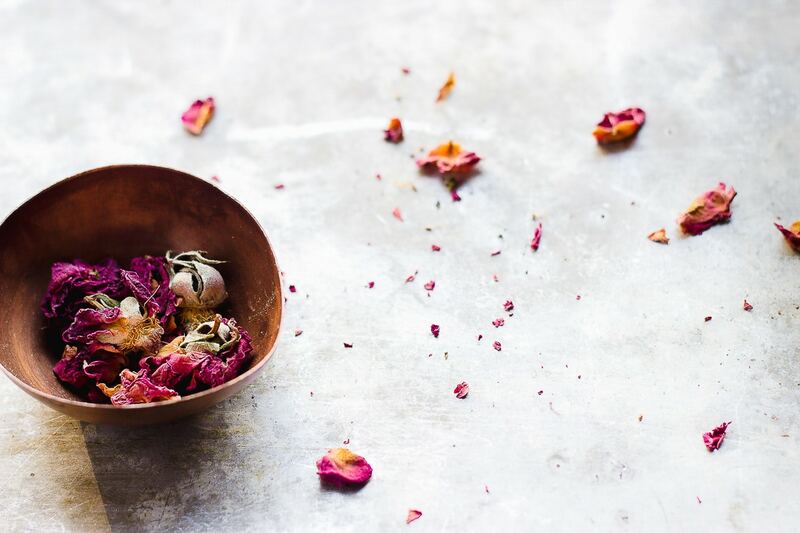 Cacao nibs and rose petals, equal you slay me. Enjoy your time off. Roses roses everywhere! This is a dream of a post. I want literally everything. Thank you for inspiring me to so much beauty and deliciousness, Sherrie! I hope you have the greatest and most relaxing time with your man with nary a communication device in sight. You deserve it big time. Please food fax me one of these doughnuts before you leave tho. Sending hugs and love. Hope you have a relaxing and well deserved vacation! Love how you fancied these up with roses. What beautiful donuts yes roses make everything wonderful. Yes! These look amazing! Have a great trip! These looks so cute and scrumptious. Have a wonderful holiday. These are such beautiful little donuts! And I hope you have a lovely time on your vacation. These are soo freaking dreamy, I can’t stand it. I love love love rose in and on everything, always! Now, to get someone to serve these to me in bed tomorrow morning, that’d be great. These are just the prettiest, Sherrie. They make me smile. Enjoy your time away! xo. Yum!! I have missed donuts so much since going vegan. I definitely want to try these! Is this dough dry enough to mold by hand, or are the donut pans necessary? Pans are definitely necessary – this is a batter not a dough. These are beautiful! Hope your vacation is super relaxing and can’t wait to read about your adventures when you’re back. Have a wonderful and well-deserved trip, Sherrie! Love that these are gluten and dairy free. A recipe the whole family can enjoy! Thanks for the Valentine’s inspiration! Dreamy pics, girl! I will totally live vicariously through you. Speaking of dreamy, I hope I wake up to big plate of these tomorrow morning. Okay, I keep meaning to get a donut pan because I keep seeing all these incredible baked doughnuts! These sound superb. I have you are enjoying your much needed vacay. I saw that you were feeling under the weather on Instagram and I hope you are feeling better too. Thanks for sharing this and feeding my current donut obsession. Chocolate and roses, wonderful. Enjoy your vacation! Ah, these are so stunning! I really need to try that Bob’s mix already – it looks perfect.